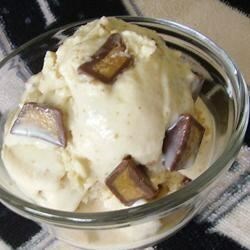 "The perfect peanut butter ice cream! Mix with peanut butter cups for an extra yummy treat. No eggs and no cooking required!" Combine sweetened condensed milk, evaporated milk, whole milk, peanut butter, sugar, and vanilla extract in an ice cream maker. Stir until sugar dissolves. Freeze according to manufacturer's directions until it reaches soft-serve consistency, adding peanut butter cups halfway through freezing cycle. Transfer ice cream to a one- or two-quart lidded plastic container; cover surface with plastic wrap and seal. For best results, ice cream should ripen in the freezer for at least 2 hours or overnight. this did not freeze up *at all*. i used a brand new ice cream maker (that had good reviews) and followed all instructions excatly but this just stayed at a liquid consistency. This ice cream is awesome! My new favorite ice cream. It turned out very rich and creamy. I used 2% milk instead of whole milk and increased the peanut butter to 3/4 cup. I will make this again, but next time I will cut the amount of peanut butter way back. It was way too peanut buttery.